Control systems operate America’s large infrastructures, such as the power grid. Although these systems do the job, their performance in delivering services to the nation could improve considerably with advancements in control methods and tools. Progress in control research and development was featured in “Control Day at PNNL,” held on August 29 at PNNL’s Discovery Hall in Richland, Washington. Sponsored by the Control of Complex Systems Initiative (CCSI), the gathering attracted representatives from PNNL, academia and industry, and allowed the initiative to highlight some of its capability developments of the past five years. 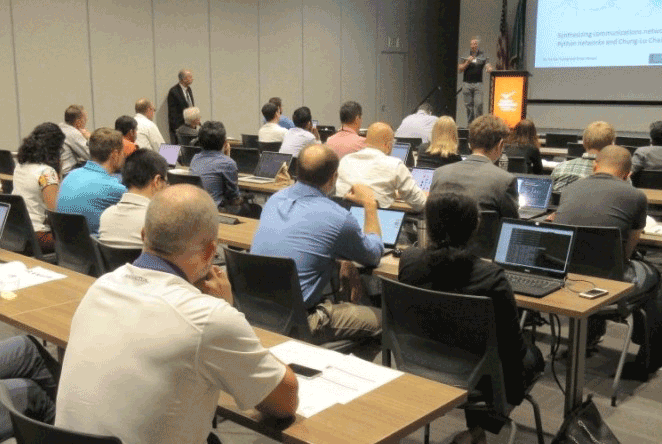 CCSI, an internally-funded research effort stewarded by PNNL’s Energy and Environment Directorate, concluded on September 30. Guest speakers included professors Ian Hiskens (University of Michigan), Subhonmesh Bose (University of Illinois at Urbana-Champaign), and Enoch Yeung (University of California, Santa Barbara), who formerly was a researcher at PNNL. Other featured speakers, all from PNNL, were researchers Jamie Lian, Tom McDermott and Henry Huang. Jacob Hansen (right), who led a CCSI project focused on application of new control concepts to large infrastructures, presented an integrated demonstration that highlights CCSI-developed tools. Many demonstrations of PNNL’s control research were presented. CCSI showcased an integrated demonstration that employed initiative-developed tools to address a transactive control challenge, and another demo highlighted CCSI’s test bed federation methodology. 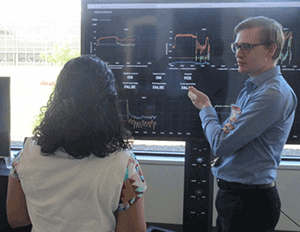 Additional demonstrations showcased PNNL control advances in a range of areas, including cybersecurity, reinforcement learning, transactive control in a campus environment, and distributed assets in support of grid services.